This delicious appetizer looks quite gourmet and fancy to prepare, but in reality, its ready in minutes! This recipe can be easily cut down to two servings if you want to make this for your special someone on Valentines Day. For the dressing, combine all of the ingredients except the olive oil in a food processor and pulse several times. Gradually add the oil and mix to combine. Heat a grill pan over medium high heat. Brush Olive oil over one side of the lettuce and season with salt and pepper. Working in batches, place the lettuce seasoned side down on the grill. Cook for one minute or until grill marks appear. Turn and cook the other side. Meanwhile, on a plate coated with paper towel, microwave the pancetta slices for one minute. To plate, lay out 6 pieces of romaine on 6 plates. 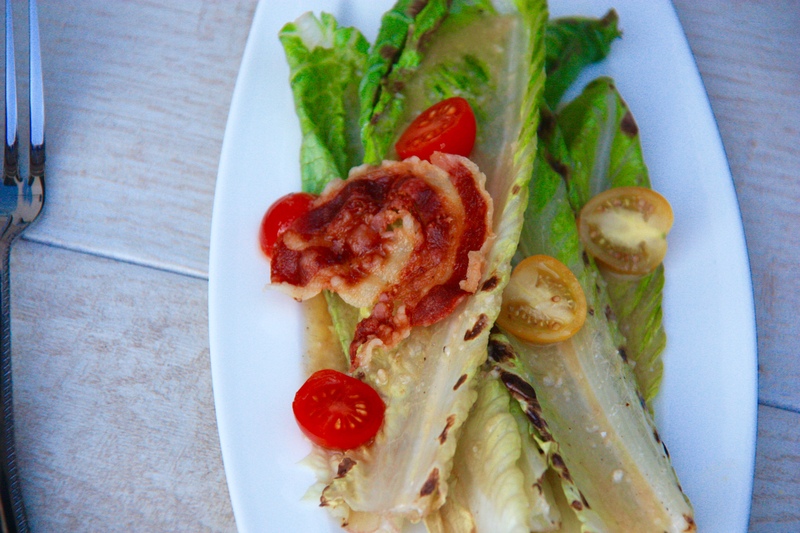 Drizzle the dressing on the lettuce and garnish with the tomatoes and pancetta. Serve and enjoy! The dressing can be made several days in advance. Before serving, take out of the fridge a half hour before so it is not solid.